Illinois may be named the Prairie State, but in actuality, it is a wonderland of diversity from the bustling city of Chicago, to the rivers to the west, to the stretches of prairie and farmland in central Illinois, to the wooded hills to the south. Whether you are a nature-loving, adventure-seeking, sports-craving, superhero- worshiping, or an animal-loving type of family, Illinois offers a plethora of activities that will satisfy anyone’s needs. With so much to offer, it was hard to pinpoint only ten activities for families. But alas! Here’s our list of the top ten things for families to do in Illinois. Have fun and stay at these family-friendly hotels in Illinois. Chicago has its fair share of sports teams. Whether you want to cheer for “Da Bears” during football season, partake in the north side vs. south side baseball rivalry between the Cubs and the White Sox, watch some Bulls basketball or Blackhawks hockey, no matter when you visit there’s sure to be a game. Not enough time to catch a game? Taking a stadium tour lets you go behind the scenes and access the normally inaccessible and in less than an hour you’ll learn secrets you’d never know about otherwise. 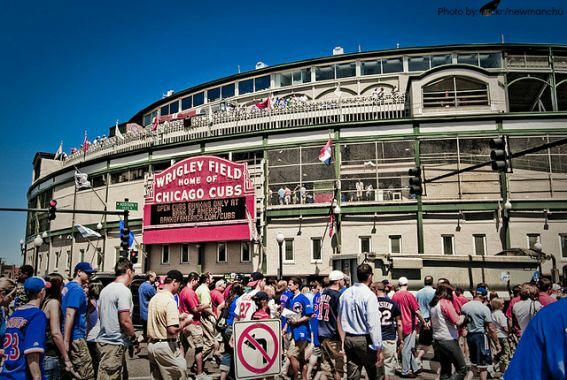 Choose from a tour of the beloved Wrigley Field, U.S Cellular Field, or Soldier Field, the largest veteran’s memorial outside of D.C.
Reserve your hotel for the GAMES! If you want something more low key and manageable, nothing beats the family-friendly atmosphere at the minor league games of the Kane County Cougars, Schaumburg Boomers, or Peoria Chiefs. In Freeport, little sluggers will get a kick out of the Little Cubs Field, a mini-replica of Wrigley Field with actual ivy, dirt, and seats from the original stadium. Do you have a favorite sports venue? Let’s hear about it here. Check out these Chicago hotels recommended for your family! What do you get when you combine jaw-dropping architecture, beautiful landscaping, and year round entertainment? Why, Millenium Park, of course! 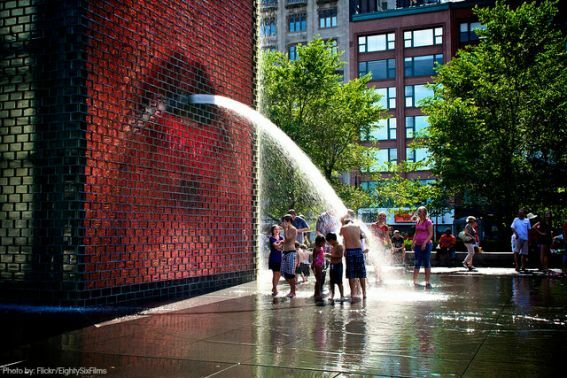 Take a requisite photo by the world famous “Cloudgate” also affectionately known as the “Bean.” In the summer, listen to the sounds of music from a summer concert at the Jay Pritzker Pavilion, participate in the Family Fun festival, or get splashed at the Crown Fountain. In the winter, show off your ice skating skills at the McCormick Tribune Ice rink, or listen to Christmas carols at the “Bean.” One thing’s for sure – visiting the Park is truly a year-round destination that poses the perfect diversion from the normal. For picture-perfect views and a step back in time, a visit to one of the many charming small towns in Illinois is just what you need. 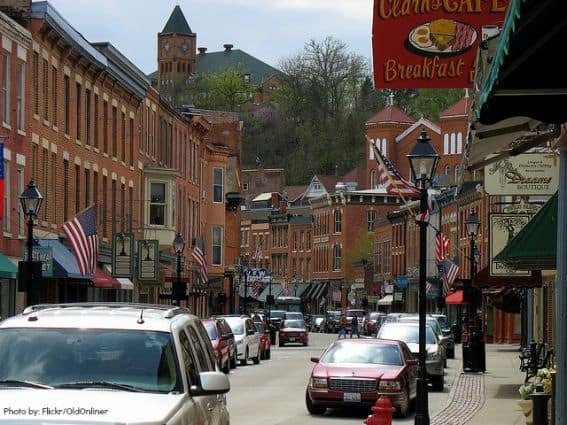 With an enchanting downtown lined with historic brick buildings, gorgeous scenic vistas with rolling hills, and a rich history, it’s easy to see why Galena gets the national recognition it does. Main Street is not to be missed with over 90 shops, boutiques, restaurants, art galleries and more – in buildings that date back to the 19th century. You may want to steer the kids away from most of the antique (read: fragile) shops, and divert them to the toy stores instead: Atomic Toy Company and R Toys & Gifts. Kids will have a blast riding down the alpine slide at Chestnut Mountain Resort. Movie lovers, on the other hand, will love exploring Woodstock, the location of the film Groundhog Day. For those who relish Victorian architecture, cobblestone streets, or a historic square, you’ll realize why people choose to visit this Midwestern town. What’s your favorite small town? We’d love to hear about it! Find the best prices on Chestnut Mountain Resort! Do you have a Superman fan? If you do, a visit to Metropolis, THE official hometown of Superman, is a must! With names such as Superman Square and the local newspaper fondly named the Metropolis Planet, it’s clear that this small town of 6,500 people has embraced the Man of Steel. Don’t forget your camera – there are plenty of photo ops throughout town. Have your little superheroes pose by Metropolis’ famous 15-foot statue of Superman, the new Lois Lane statue, a Kryptonite meteorite, or Clark Kent’s photo booth. 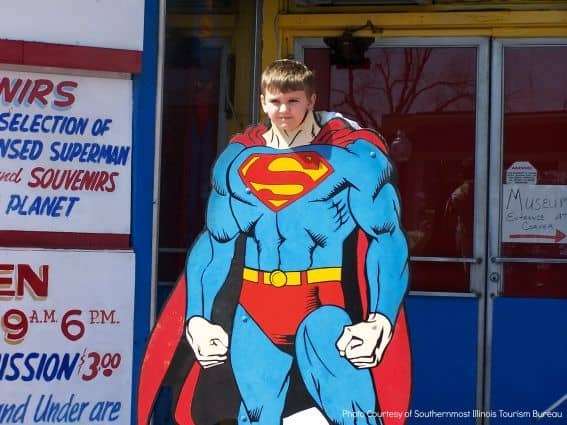 For more fun pictures, find cut-outs of Superman and Lois Lane scattered throughout town. Take a peek inside the Super Museum to find rare collectibles, props, costumes, and other memorabilia worth over $2.5 million of Superman collectibles. Don’t forget to stop by the gift shop for a one-of-a-kind gift. A Metropolis visit would not be complete without a trip to the largest Dippin’ Dots ice cream shop on the planet where you’ll find super flavors like “Lois Lime” and “Clark’s Cookies n’ Cream.” Yum. Mark your calendars for June 6 – June 9 for the Superman Celebration where over 100,000 people celebrate the Man of Steel. Don’t forget to wear your superman costume to win the best-dressed contest, participate in superhero game shows, enjoy (or participate) in a peanut butter and jelly eating contest, or meet actual movie stars. Sounds like a super fun time for the family! Visit Superman in Metropolis with the kids! It’s no secret that kids LOVE seeing animals. Not only will you find almost every animal at the Brookfield Zoo, but it caters to families and children. Within the zoo is the Hamill Family Play Zoo, where kids are encouraged to do what they do best – touch, explore, build, and do. Bring the whole family to the Zoo and book your hotel in Brookfield for your stay! To see animals more in their natural setting, look no further than the Wildlife Prairie State Park. At the Wildlife Prairie State Park, you’ll find bison, black bears, and other 50 native species to Illinois roaming around the grounds. For more of a wild time, catch a ride on their safari-like bus that drives through the prairie where elk and bison wander freely or ride the train to view the surroundings from a different point of view. For an even more unique experience, spend the night on the grounds sleeping in a cabin, cottage, tent, a real caboose car, or stables. Growling for more animal interactions? Check out this list of family-friendly animal outings around Chicago and a list of free zoos across the nation. 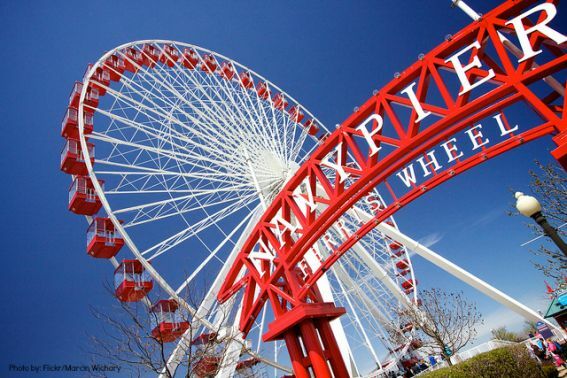 Navy Pier may have once been used for shipping and recreational purposes, but today it has become Midwest’s #1 tourist destination. As a local, I have to admit that it is also one of our favorite places to visit because there’s so much to do for families. Sure, there’s the iconic 15 story Ferris Wheel that you can ride, but the fun doesn’t stop there! Stop by the Chicago Children’s Museum where learning through play is the main agenda. Or catch a kid-friendly Chicago Shakespeare Theater show or an IMAX movie. Cruise on Lake Michigan with a scenic Shoreline cruise or a thrilling Seadog cruise. Enjoy seasonal offerings like Winter Wonderfest’s holiday happenings or fireworks on summer nights. There always seems to be something happening at the Pier so be sure to check its website for the full calendar of events. Need a place to stay? Find your hotel here. 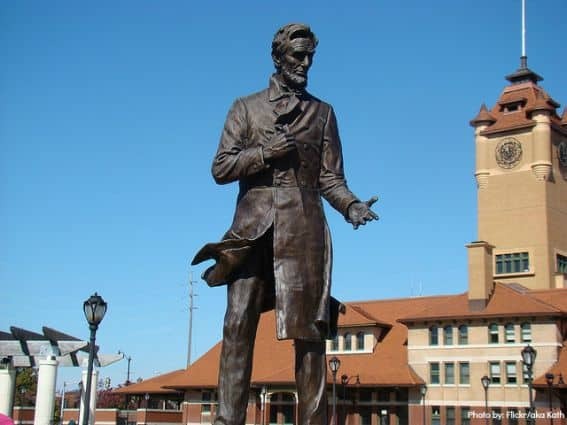 As “The Land of Lincoln,” Illinois has more than its fair share of attractions revolving around the 16th President. For all things Lincoln, the very first place on your list should be the Abraham Lincoln Presidential Library and Museum that combines state-of-the-art technology with history. For a more authentic experience, walk in Honest Abe’s footsteps at the Lincoln Home Natural Historic Sites, a four-block neighborhood restored as it was in the 1860s that includes his actual home. Ready to immerse yourself in more history? Look no further than the recreated working pioneer village of New Salem where Lincoln worked. Period re-enactors are on hand for demonstrations, and you can even participate in activities from that era. If you need a break from history, come during one of the ten days of the Illinois State Fair, one of the largest agricultural fairs in the country. From good but not-good-for-you foods to can’t-miss-attractions such as a cow sculpted from 500 pounds of butter, the fair is anything but ordinary. For other diversions, visit the Henson Robinson Zoo or the Knight’s Action Park & Caribbean Water Adventure. After a day of exploring Springfield, it’s time to rest. Check here for family-friendly Springfield accommodations. 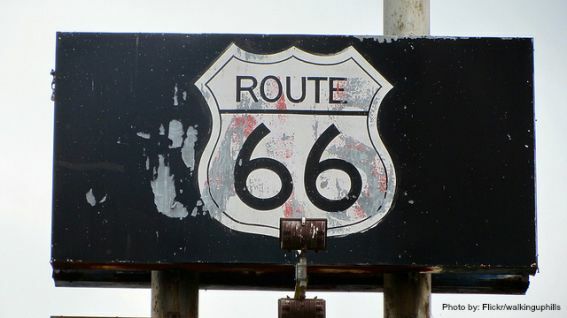 Route 66 is THE ultimate road trip that not only starts in Illinois, but for 400 miles boasts the largest concentration of The Mother Road’s kitschy roadside attractions, museums, and restaurants. Who can resist stopping to see the world’s largest catsup bottle or seeing a 19-foot Paul Bunyan holding a hotdog? While cruising down Route 66, pit stops to would not be complete without chowing down at Dell Rhea’s Chicken Basket, indulging in ice cream at Rich & Creamy at Broadways, grabbing a blue-plate special at the original Palms Grill Café, or visiting the originators of the corn dog on a stick at Cozy Dog’s Drive-In. Experience a taste of Americana for yourselves! Not only will you find nostalgic attractions, but Route 66 has welcomed modern attractions such as a new automobile museum and a museum dedicated to all things Route 66 at the Hall of Fame and Museum in Pontiac. Explore more on Route 66! The Museum of Science and Industry’s mission is to inspire the creative genius in everyone, and after exploring through 14 acres of hands-on exhibits, kids and adults will no doubt leaving being inspired. As the largest science museum in the western hemisphere, it is nearly impossible to see and do everything in one day. Speaking from experience, families will keep coming back again and again. With its variety of exhibits, there is truly something for everyone in the family. Younger kids can spend the majority of the day playing at the Idea Factory with interactive exhibits perfect for the pint-sized science fans. Kids will be amazed at watching a toy created from start to finish at the ToyMaker 3000. Young (and old) train fans will marvel at over 30 trains chugging through 1,400 feet of track and landmarks, or they can even climb aboard a tour of the Pioneer Zephyr, America’s first diesel-electric passenger train. Older kids will be fascinated with Science Storms by making Mother Nature’s phenomena such as tornadoes, tsunamis, or lightning interactive. Challenge someone to a game where you’ll need to move a marble using only your mind. Talk about mind over matter! Adults will enjoy hopping aboard an actual U-505 World War II German submarine. For more hands-on-fun, The Discovery Center Museum in Rockford is worth a visit. 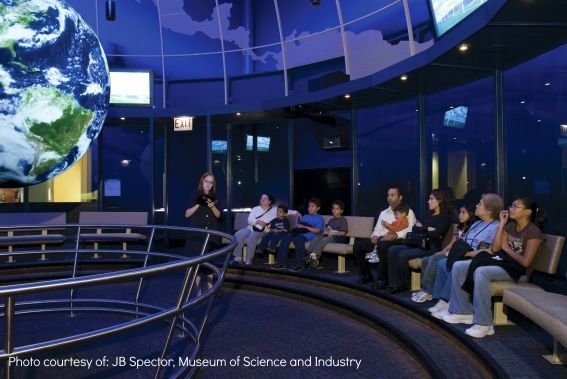 Earlier this year, it was noted as one of the best science museums in the nation. The exhibits may be loads of fun, but families should make time for its outdoor science park that combines a wooden playground with hands-on experiments. Book your hotel in Rockford for more science fun! With 5 scenic byways, over 50 different state parks, and a plethora of nature centers, you won’t have to travel far to be one with nature. 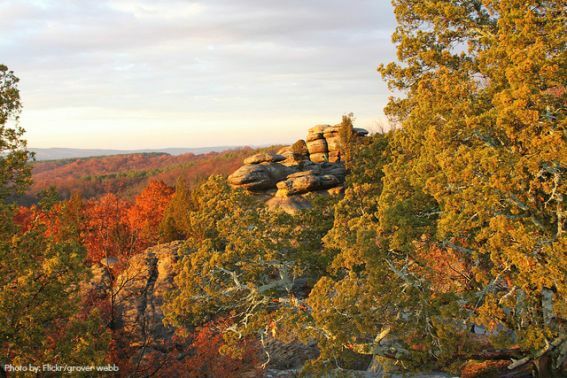 Magnificent doesn’t begin to describe the massive 70 mile Shawnee National Forest with its rolling hills, lakes, and rugged bluffs. For an experience like no other, don’t miss the Garden of the Gods. Its massive sandstone formations and magnificent bluffs live up to its name. At Starved Rock State Park, your outdoor adventure awaits as you explore 18 canyons, waterfalls, and unbeatable views of the Illinois River from 100 feet high. Hike over 13 miles of well-marked trails with varying levels of difficulty. The Park offers a variety of family-friendly programming that includes guided family hikes or even one-on-one time with animals. Looking for a place to stay? Staying by these state parks doesn’t mean you need to sacrifice comfort. If you’re in the Shawnee National Forest, how about sleeping in a treehouse? At Starved Rock, stay at the Starved Rock Lodge, one of the Midwest’s finest park lodges. 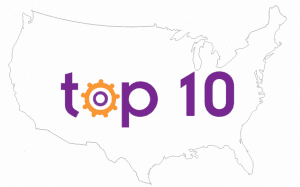 Loved the top 10 things for families to do in Illinois? What state do you want to visit next! Cheryl, this list is AWESOME! I forgot all about Metropolis and never even heard of Wildlife Prairie State Park. THANKS!!! This is a great list of family fun things to do in Illinois. Honestly, I had never even heard of several of them so this is very helpful! Great ideas! This list is well compiled and leads one to find and enjoy great treasures statewide. Great guide for a family. Worth passing onto both IL residents and outsiders. Only suggestion or add might to be recommend Arboretums/Botanic Garden or something train related (Amboy, etc) as IL has preserved much train/trolley history.